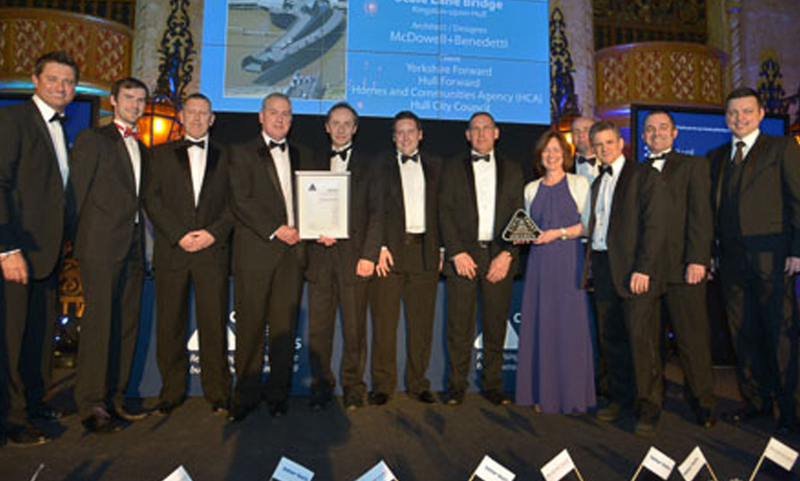 The Scale Lane Bridge has won a Civic Trust award as well as a Special Award for Community Impact and Engagement. The bridge was designed, fabricated, installed and commissioned by Qualter Hall, based on an original concept by architects McDowell+Benedetti with Alan Baxter Associates as structural engineers. George Clarke, architect and TV presenter and Civic Trust Awards Managing Director, Malcolm Hankey, presented the 2014 Special Award for Community Impact and Engagement, highlighting the excellent work and involvement from the local community ensuring they played their part from the very start of developing the footbridge in Hull. The second award for the bridge recognised the high quality architectural design and landscape, which is accessible to all users and visitors and having a positive cultural contribution to the local area. Representatives from Hull City Council, Homes and Communities Agency, main contractors Qualter Hall and architects McDowell+Benedetti and other members of the design team attended the awards ceremony in Blackpool on Friday 7 March 2014, along with 350 other guests. Located east of Hull city centre the unique 57 metre span pedestrian and cycle way swing bridge is believed to be a world first offering pedestrians and cyclists the unique experience of being able to walk/cycle on and off the bridge and ride on it while it is in motion. Its sleek black steel appearance and distinct, sweeping form, which incorporates upper viewing decks plus a 265m square interior space with panoramic views, makes it a memorable landmark that reflects Hull's industrial and maritime heritage. The bridge connects Hull's Old Town Conservation Area to the undeveloped industrial landscape of the East Bank helping to unlock the potential of the riverside and promote wider regeneration in the area. The bridge also provides a walkable route connecting the Museums Quarter on the West Bank to Hull's major attraction The Deep. The scheme also includes a new landscaped garden and square situated at the threshold of the bridge on the West Bank. 'This Award acknowledges impact that the Scale Lane Bridge is having on the City of Hull. The bridge is an amazing piece of engineering which has provided a valuable link across the river and more importantly is an interesting and beautiful addition to the city. 'As main contractor responsible for the design, manufacture, installation and commissioning of the Scale Lane Footbridge, we are clearly both delighted and very proud to have received two such prestigious awards from the Civic Trust as well as the WAN (World Architectural News Transport) Award to date. 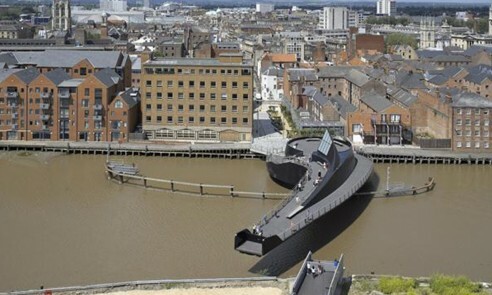 The design of the bridge is certainly unique and it has been a privilege to be involved with a project that not only serves the practical purpose of linking the east and west banks of Hull, but has also created a new cultural landmark for the City of Hull.